UCHealth employees in Texas proudly fly a Colorado flag. From left to right: Hannah Fell, ACP, Chris Shults PA, Margaret Mazzerello, NP, and Christina Miller, ACP. One Colorado nurse has a passion for relief work and is now just outside of Houston at a hospital where she’ll be working nearly around-the-clock for the next two weeks. 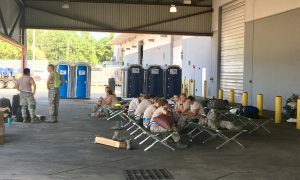 A physician assistant and nurse practitioner who are part of a Colorado Air National Guard team are sleeping on cots outside on the tarmac at George Bush International Airport in Houston, where they’ve set up a mobile hospital to care for people suffering in the wake of Hurricane Harvey. On Thursday, they were on standby to assist people coping with chemical fires from a peroxide plant in Crosby, Texas. 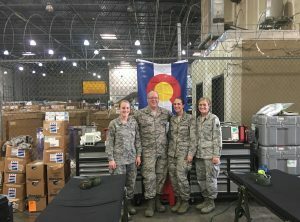 A team of medical providers from Metro Denver and Fort Collins who serve as part of a U.S. Health and Human Services emergency response team, are in Dallas now as they await orders on where to set up a mobile ER or field hospital. Harvey undermined the entire water system in Beaumont, Texas, population 120,000, spurring a hospital there to evacuate all of its patients. The emergency team steps up to care for patients like those or regular folks who haven’t been able to get essential medication and treatments. And military veterans who serve as security guards in Colorado Springs are headed to San Antonio. Once in Texas, they’ll jump in to help wherever they are needed. All are UCHealth employees who have rushed to Texas to help after Hurricane Harvey swamped millions of people, wreaking unprecedented damage. Here in Colorado, a second wave of staffers has stepped up to cover shifts for those who are working on the front lines. Rachel Kuker, 31, is a pulmonary nurse who works at UCHealth’s University of Colorado Hospital. She has done mission trips in the past and three weeks ago she took a training course at the hospital called The Radical Humanitarian. It helps health workers get involved in global relief work. Kuker is registered with a relief agency called Health Trust and at 8 a.m. Wednesday, she received a text asking if she could go to Texas the next day. A number of UCHealth employees have gone to Houston to help with medical needs for Hurricane Harvey survivors. This is a makeshift sleeping area for caregivers. So Kuker talked with her boss, canceled a trip to Yellowstone and found friends to keep an eye on her cat, Vegas. Then she raced to the airport, flew to Dallas Thursday night and headed to Houston today. There was a chance that Kuker was going to have to ride on a boat in the flooded zone to a hospital. But she ended up at Conroe Regional Medical Center bout 30 miles outside the city. Kuker is expecting to work 16-hour days, sleep on a cot in the hospital, get a shower every three days and average about five hours of sleep a night. Kuker’s supervisor, Kaycee Shiskowsky, jumped into action when Kuker came to her with the request. She knew she would have to scramble to cover Kuker’s shifts. But she told Kuker right away that she fully supported her. “Rachel is one of our star performers. She’s gone the extra mile. She’s done a lot of projects and improved our unit. She does all of our scheduling, so it will hurt a little bit, but we certainly wanted her to be able to offer her services to others who need her,” Shiskowsky said. “The need is greater in Texas,” Shiskowsky said. Christopher Shults, 53, is a physician assistant in the trauma and acute care surgical unit at University of Colorado Hospital. He’s a captain with the Colorado Air National Guard and was asked to deploy with the guard’s 140th CERFP medical group. Because they were flying on a military plane, they were able to land at George Bush International Airport in Houston. As the big cargo jet banked over the city on Wednesday, Shults said all he saw was water. “You could see a lot of the devastation. Some of the fancy homes on the bayou are barely visible. There are reports of alligators in the streets. But the airport is in good shape,” Shults said. UCHealth employees have journeyed to Texas to help out in the aftermath of Hurricane Harvey. This photo shows a treatment unit where sick and injured will receive care. Team members set up cots and are sleeping on the tarmac at the airport. Yes, it’s noisy and hot. But Shults and his colleagues are in their element. “This is why we put on the green suit every day. It’s part of our duty. I have the ability to help. I’ve been fortunate in my training and experience over the years. I’ve been in medicine since 1978,” Shults said. He started as a paramedic and has been a physician’s assistant for more than 10 years. “It’s good to give back. If something happens to Colorado, I would like to think we’d get a lot of response from people everywhere,” he said. Shults’ daughter happens to be deployed as part of the same 45-member unit. So is his colleague, Margaret Mazzarello, a nurse practitioner who works in the colorectal surgery department at UCH. Mazzarello, 42, is working nights from 6 p.m. to 6 a.m., so she tried to take a nap on the tarmac on Thursday afternoon to prepare for her shift. “It’s pretty hot, but once you’re tired enough, you can sleep anywhere,” she said. Service is part of her family’s DNA. Mazzarello served in the military and then joined the National Guard in 2015. Her husband just returned from service in the Air Force. She said they can handle medical emergencies like resuscitating people. She also expects to treat people overcome with stress. “We’re going to be able to do psychological support and triage anything. We’ll evaluate people. Sometimes people have anxiety,” she said. The team expects to be in Houston for at least two weeks. A separate group known as a Disaster Medical Assistance Team (DMAT) has also been deployed to Texas. They serve under the U.S. Department of Health and Human Services. Cindy Larson is based in Fort Collins and works for the UCHealth clinical informatics team. She is a leader for the 36-member medical assistance team. They are now in Dallas awaiting orders on where they are needed. She’s a pro at providing disaster assistance, having served during five hurricanes including Ike, Sandy and Matthew. Larson started with the team in 2007. Like many, she wanted to do something after Sept. 11 and her husband, who is a paramedic in Loveland, told her about this team and its role in serving during emergencies. As soon as their children were old enough, she joined. “The community is amazing, the little we’ve seen and interacted with it,” she said. 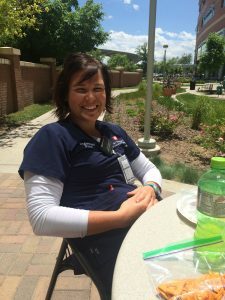 Rachel Kuker, 31, a pulmonary nurse who works at UCHealths University of Colorado Hospital, is one of several UCHealth employees who will help out in Texas. Dr. Charlie Little leads the DMAT team. He’s an emergency medicine physician at UCH and is also the medical director for emergency preparedness. “This is such an overwhelming event. Even well prepared hospitals are experiencing failures and are having to evacuate and having to make alternative care arrangements,” Little said. 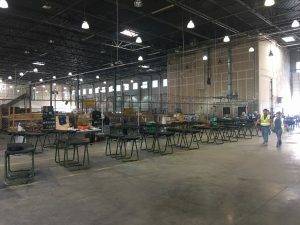 The team is ready to set up a field hospital as a stand-alone center or they can create a mobile ER in a parking lot to add extra support for an overwhelmed facility. During disasters, Little said, many people dealing with chronic illnesses suffer because they can’t access regular care. “When a hurricane hits a community, suddenly several million people have no access to health care,” he said. Problems can last for weeks, long after news about a big event like Harvey begins to fade. “The medical needs of the community are really big for a month or longer. What will happen is people who had chronic medical issues that were managed pretty well will now be without care for several weeks,” Little said. “We see a lot of sickness related to the aftermath of an event like this,” Little said. He served during Sandy and during the cleanup they cared for patients experiencing asthma related to mold in their homes. People also can get injured during cleanup. Little is on call four months each year. The team got word that their help might be needed on Monday and by Tuesday at 5 p.m., they learned they were being activated. Joshua Melito, a security officer who works for Allied Universal at UCHealth Memorial Hospital, will fly to Texas with four other officers from Memorial on Saturday. Melito said he and his colleagues will fly to San Antonio, Texas, and then drive to the Houston area. He is not sure where they will be assigned. “I’m willing to help out any way I can and it just so happened to work out with my job, so I’m happy to help,’’ he said. A former soldier in the U.S. Army, Melito has deployed to a natural disaster before. While stationed at Fort Benning, Georgia, he and other troops were sent to help in the aftermath of a tornado. Melito, has been on the job at Memorial for one month, said he has family in Houston, and when his boss, Terry Knapp, security manager at Memorial, asked for volunteers, Melito said he quickly raised his hand. “I don’t know the specifics yet, but I know that our company is bringing in resources from all over the country. I’m feeling pretty good about it,’’ Melito said. Another UCHealth employee, Erin Lennon, a physician assistant in the trauma and acute care surgical department at UCH, is also part of the DMAT team. She has served since 2013. As they waited for their assignment Thursday, Lennon was itching to get to work.